Where to begin this SMcG post? It’s my first post since December of last year, and a lot’s happened and changed since then. Most significantly, I’m a dad now! My wife and I had our first baby on May 23rd, and his name’s Elliott. If you do the math, he’s not even 3 weeks old yet, and I’ve been off on leave of absence from work this whole time (I go back to work this Friday). So although I’ve got numerous new cocktails I’ve tried since December 2012 to write about, I guess it’s only fitting that I start with an original one I created specifically to mark the occasion of our little man Elliott’s birth… It’s called “The Little Man”. In addition to this drink (the most important one to me), I’ve got 19 other new drinks I’ve mixed up for the first time, and one delicious punch on top of that, since my last entry. There’s no way though that I’d want to even write about that many all in one post, nor could I even do so if I wanted to, what with the 3-week old baby in the house and all. So I’m going to keep this post really short and sweet, in hopes that by doing so, I’ll be more inclined to write more frequently than I’ve been doing recently. 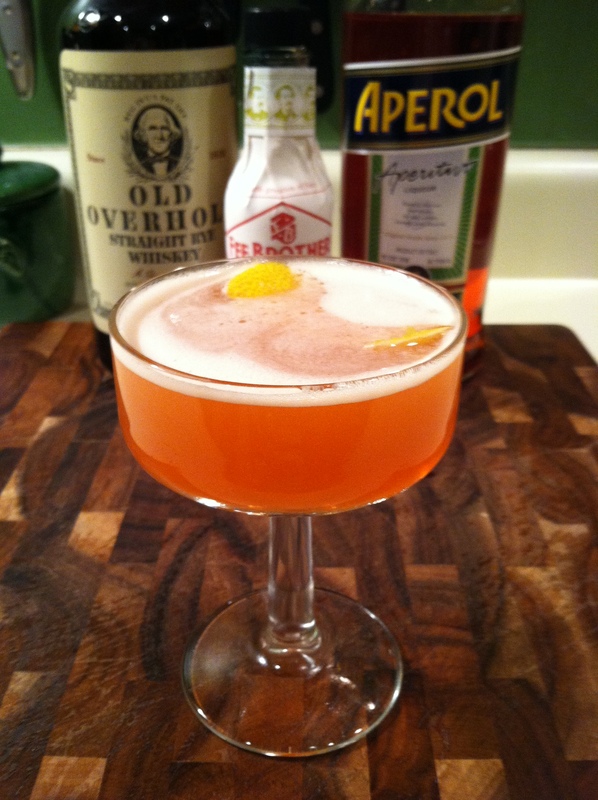 So for sake of brevity, I’ll keep this post to two drinks – two cocktails that I invented in fact… “The Little Man” and “The Billiken”. Although the Little Man is the drink closest to my heart, the Billiken is the original creation that I’m most proud of simply because it’s a damn good drink (if I do say so myself). The Billiken was created back in March during the NCAA March Madness college basketball tournament in tribute to my hometown school and alma mater college basketball team of Saint Louis University. But above all cheesy symbolism, the drink’s a fun one to drink. It’s a refreshing drink that I think would appeal to many different folks… it’s a sour while still being a mellow, smooth drink. 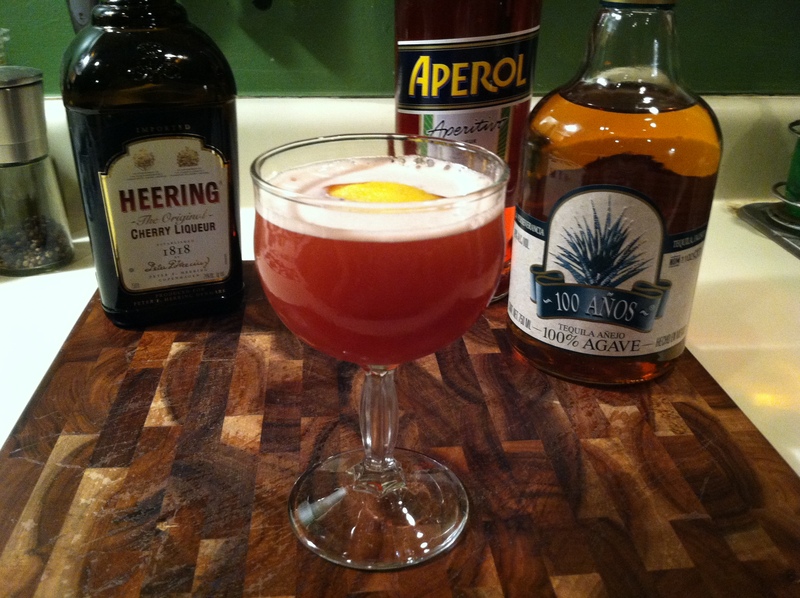 I think that the variety of ingredients, from the amaro to the simple syrup to the lavender bitters to the lemon create a few different layers of subtleties, and offer a little bit of something for everyone’s tastes. A good drink for a great time in my life. Cheers to Elliott! Stir well with ice and then strain into a chilled cocktail glass. Of all the spirits to choose from, I figured gin spoke to me most when it came to basketball. (Whiskey just doesn’t seem like a basketball liquor.) The particular ingredients in this drink are fitting because, like SLU, none of them are particularly cheap (inexpensive). Also, these specific ingredients (ie. Lillet, St. Germain) tend towards the fancier and “less rugged” persuasion, I guess you might say… also similar to SLU and its student body. Lastly, the blueberries fit the school colors and may serve as a loose reference to basketballs. But most importantly, it’s a well built and tasty drink. 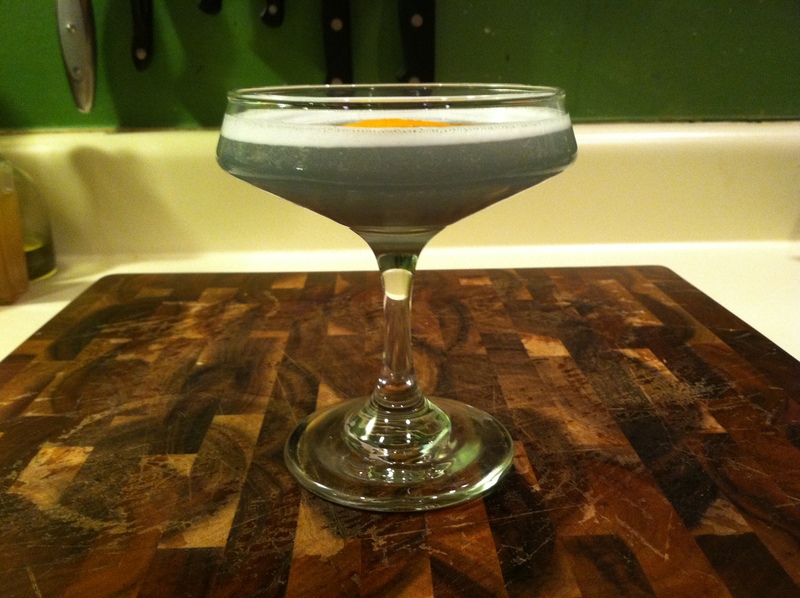 I think of it as sort of an “elegant Corpse Reviver”… light, fancily delightful and delicious… like a ballet or a good game of college basketball. After what I think is the longest stretch of time without a new Scientist McGee post, I’m back with a fair share of new drink recipes. It’s been nearly 3 months since I last wrote, and in that time I’ve mixed up 8 new drink recipes and also become the proud owner of an all-new bar in my home! 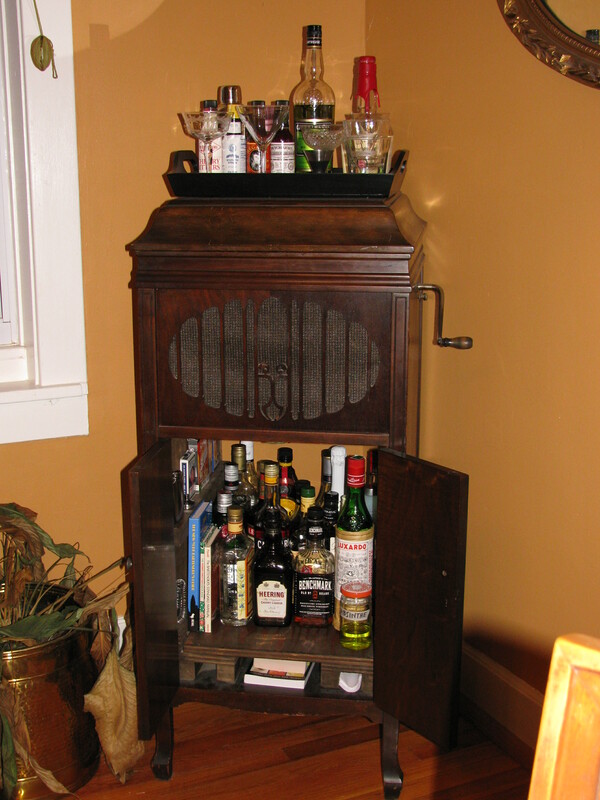 I had outgrown my old bar which was an old victrola record player. The victrola was a good bar and did a good job, but with the accumulation of more and more ingredients, and more and more glassware, I was sort of taking over our dining room table and buffet. I was getting sideways looks from my wife, and I knew something had to be done to organize my growing hobby. Lo and behold, as I’m mowing my lawn one nice Saturday, I go out to the alley in the back of my house, and I find the answer to my problem… an old cupboard of some sort. Problem solved! I LOVE my new bar! 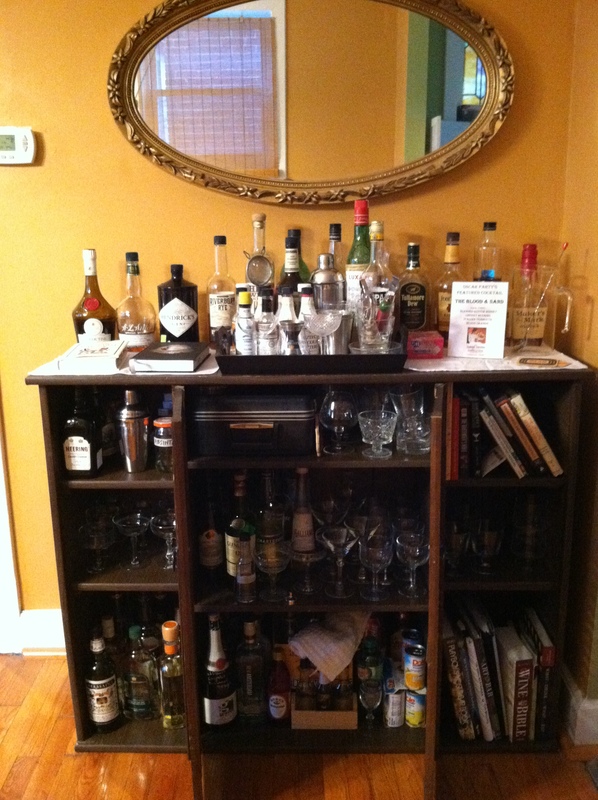 Plenty of space for all my glasses, punchbowls, books and ingredients, with room for growth to spare! 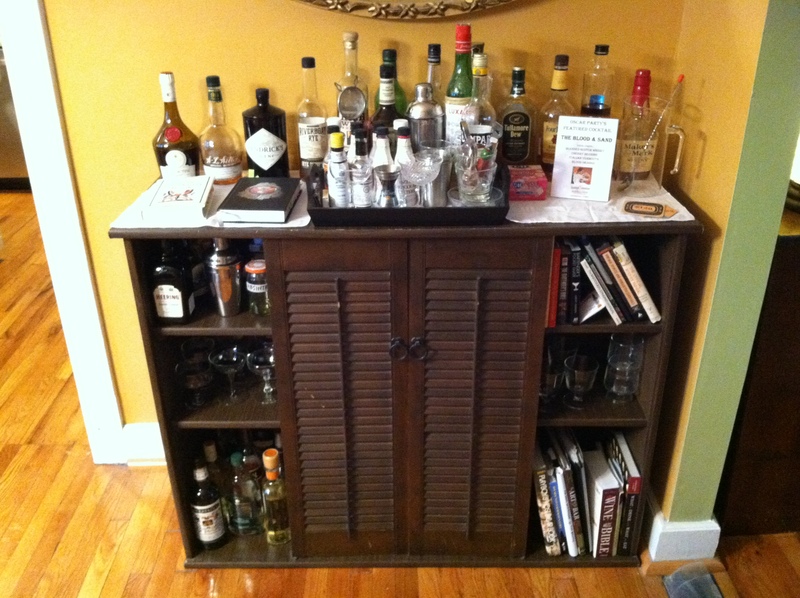 Did I mention that I LOVE my new bar? Shake well with ice, and then strain in to a chilled cocktail glass. This recipe comes from David Wondrich’s wonderful Esquire magazine articles. With my recently acquired first bottle of genever, the predecessor to gin, I was on the hunt for a good drink to introduce myself to this spirit. I tried this drink with my new bottle of Boomsma brand genever, Oude style. “Oude” meaning aged in oak barrels, and a bit of smokiness not typically associated with gin. To be honest, my first taste of genever didn’t tell me if I loved it or not. Maybe it’s an acquired taste? I’m not sure, but it was OK.. It reminds of me of Calvados or apply brandy actually…. smoky and whiskey-like, but with a little bit of a flat or shallow element and a lackluster sting at the end (?). 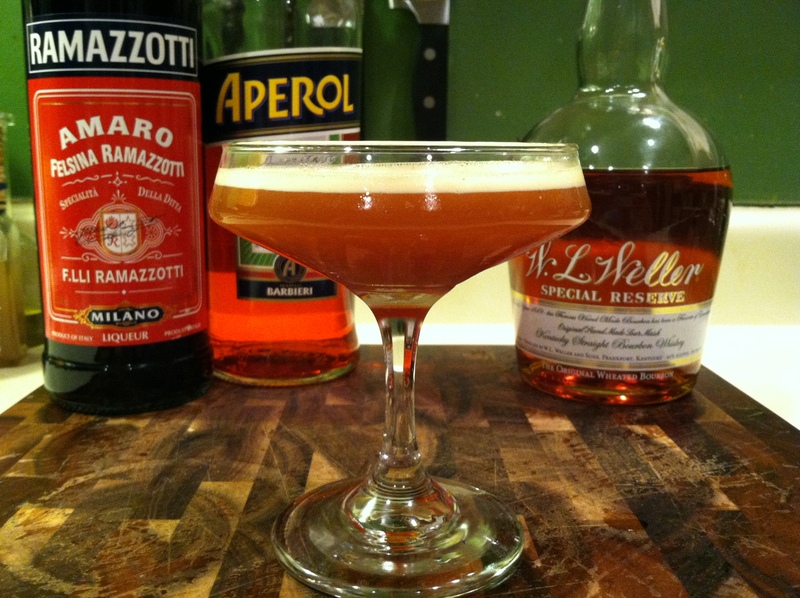 This one’s a simple drink, with just a nice taste of the maraschino. With the smokiness and “woodsiness” of whiskey and the “bite” of gin, it’s a real go-between of the two. Hmmm… time will tell, I guess. Stir well with ice and then strain in to a chilled cocktail glass. With a lemon peel, rub the rim, then squeeze and drop in to your cocktail. 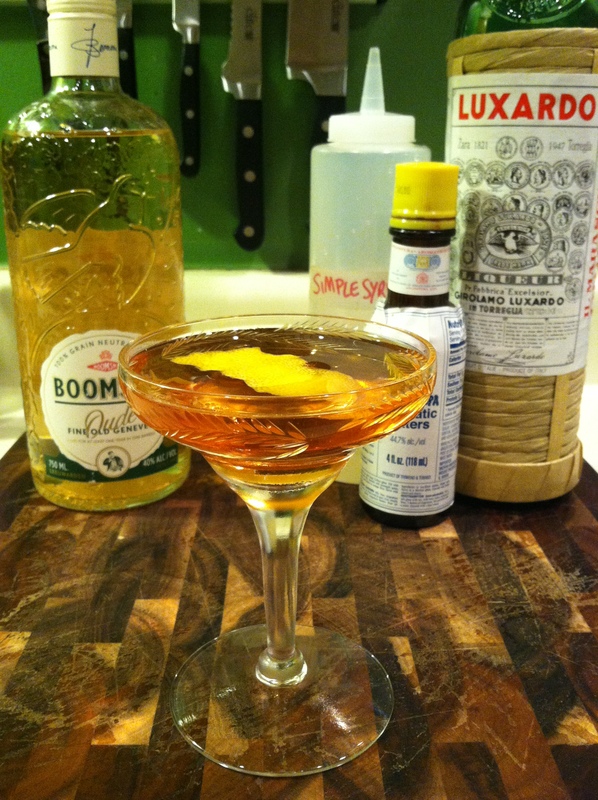 From the great book, “The Art of the Bar”, comes this drink that all I can say is, “Ehh, not that great.” I’m not a fan of the tequila and sweet vermouth combo. Maybe you are? Lastly, add a few drops of Campari to the surface. This is a pretty solid cocktail. I like it… It’s like a mellow sour. The lime hangs in the background and gets pushed a little in to the shadows by the aggressive rye whiskey. All four ingredients blend however in to a unique, unified flavor, almost a grapefruit-like flavor. Interesting, and pretty solid. Shake well with ice and then strain in to a chilled cocktail glass. 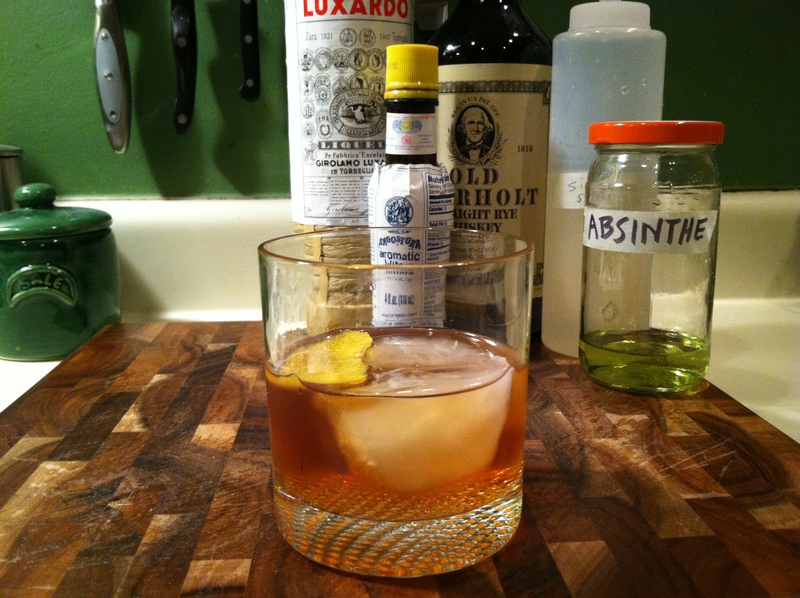 This is a tasty, “sophisticated” old-fashioned-type tequila drink. 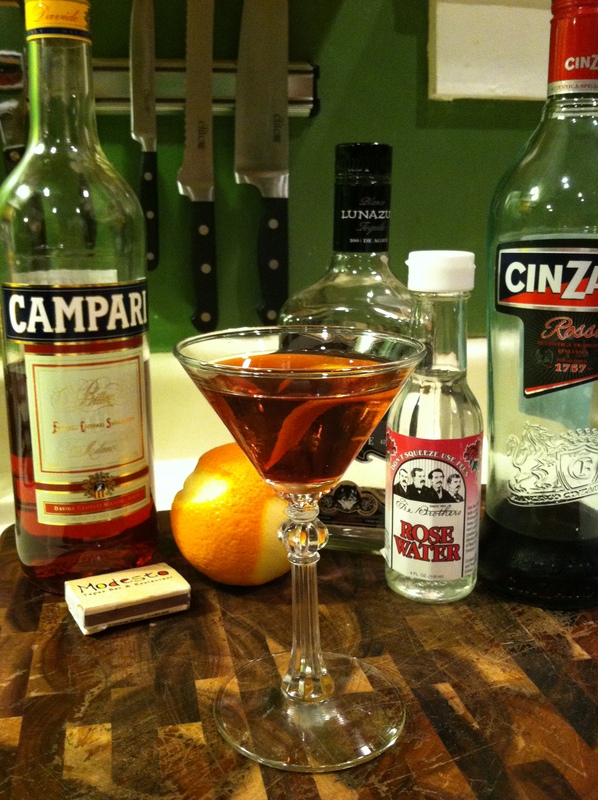 A good drink, with a lot of balance between the sweetness of the tequila and the Italian vermouth and the dryness of the French vermouth, Campari and bitters. It’s a very smooth drink, with just a nice bit of bitterness and a slight smoky/sweet flavor of the reposado tequila. Good! This drink surprised me… I thought it was very good. This drink’s from the “PDT Cocktail Book” too. However, the only reason I even tried this drink was because it came from David Wondrich, a man I respect and a cocktail expert I trust whole-heartedly. Had it not been accompanied with Mr. Wondrich’s backing, I would’ve been too skeptical of the Irish whiskey – triple sec combo. But I tried it, and I was pleasantly pleased. It’s smooth, elegant and refreshing like a gin drink, but with the whiskey solid base. It’s a damn good, easy-drinkin’ cocktail! Ehh again… Not a very good drink, in my opinion. I think it was kind of flat and “emotionless”. 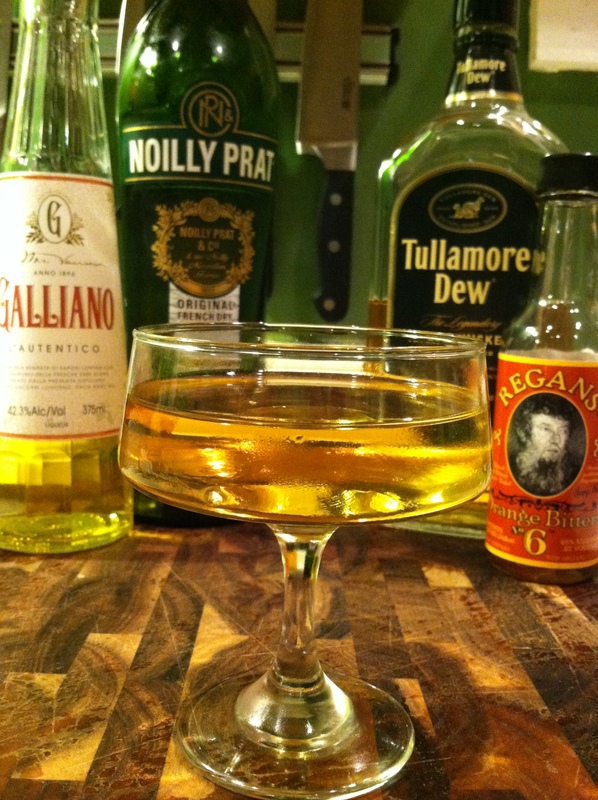 It was mainly the dry vermouth… The whiskey and Galliano were OK together, but I feel like the vermouth is just a flat and bland connector between the two. I won’t be making this one again. Oh well. This drink is pretty good. It’s nothing magnificent, but it is a good drink. The ingredients make for a pretty unique, interesting flavor. It’s a somewhat sweet drink, but with the slight aromatics of the green Chartreuse seeping through. The conclusion that you might draw from the lame title of this post is that there’s no real overarching them to this post’s drinks. You’d be right! I present to you 6 random drinks that feature random ingredients, with nothing in common with each other, other than the fact that they’re all pretty damn good. 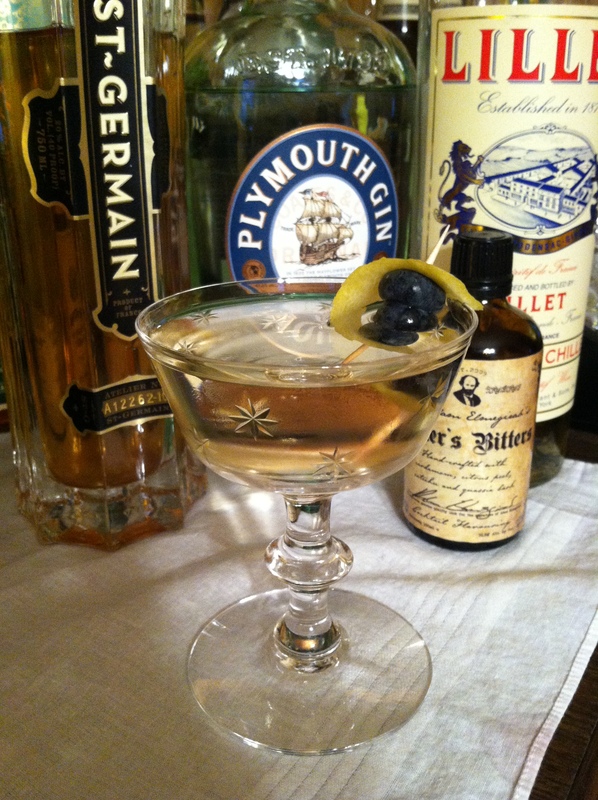 A couple of them feature Lillet Blanc, which is a new ingredient for my home bar. 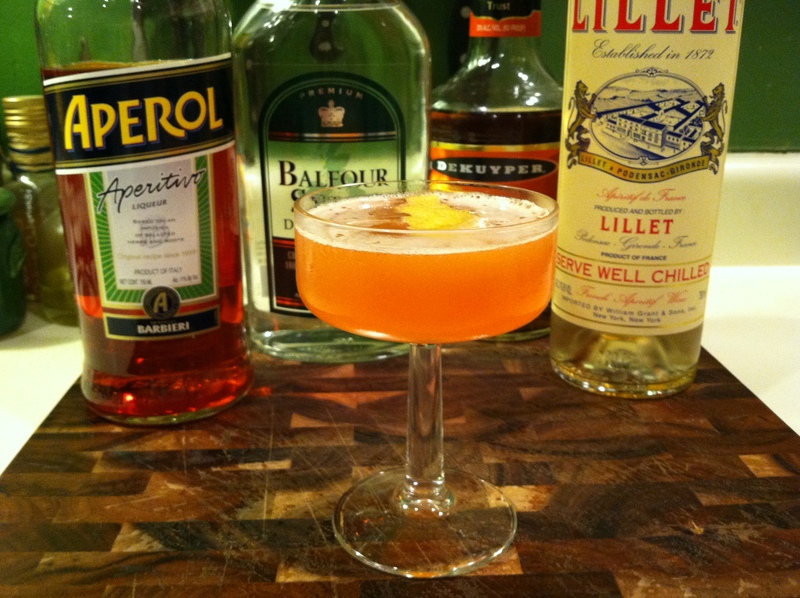 Lillet is a delicious French aperitif wine. It’s rather sweet and fruity, consisting of a blend of mostly Bordeaux wines and some citrus liqueurs. 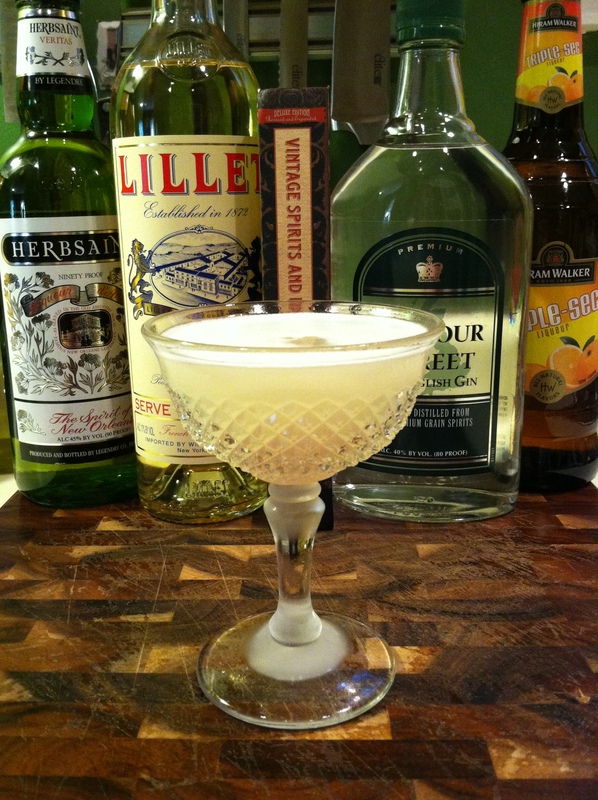 One of its most famous roles being that of a key player in a cocktail with one of the best names ever, the “Corpse Reviver #2”. 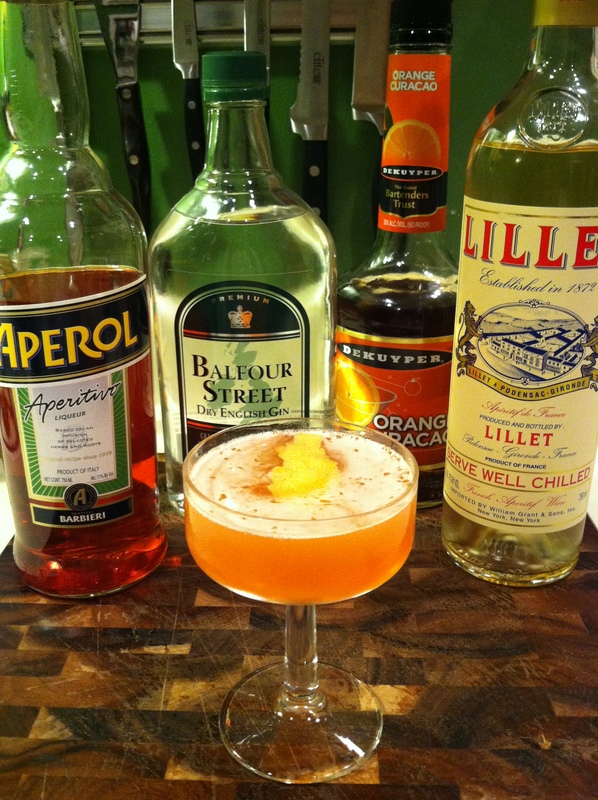 (I actually went out to get my first bottle of Lillet Blanc, specifically so I’d be able to make this drink.) 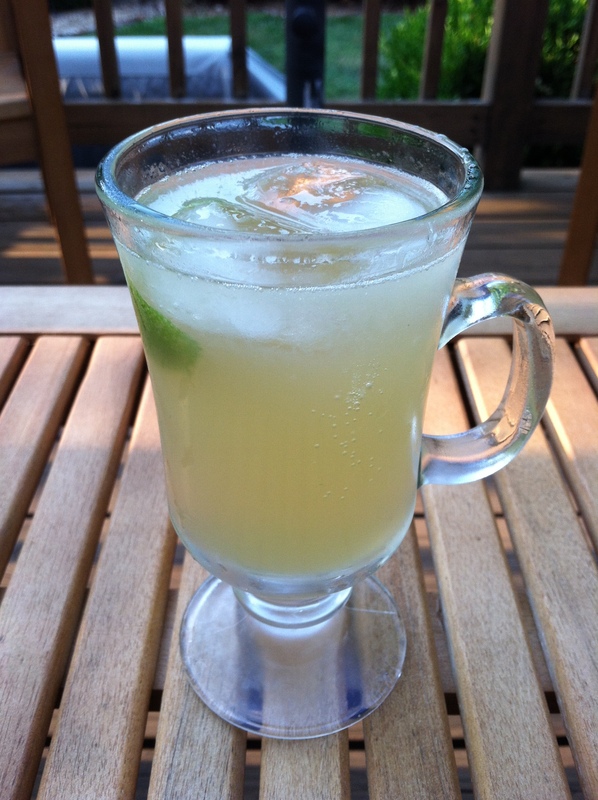 Another new ingredient featured in this post is ginger beer. I love ginger ale, but this is the first time I’ve ever tried true ginger beer. 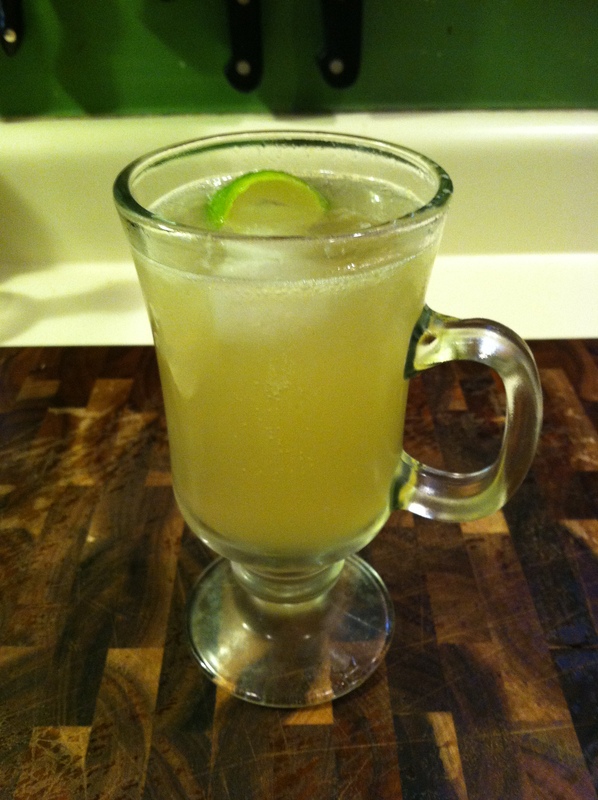 Ginger beer is what ginger ale used to be like, back in the olden days. Ginger beer actually has ginger in it, and quite the spice you’d expect from a soda made with real ginger. A lot of classic cocktails call for ginger beer, so I picked up a bottle of “Lewis Osterweis & Sons” ginger beer, made by The Saint Louis Brewery (aka Schlafly). It’s not something I’d necessarily want to drink every day, but it’s definitely worth keeping a bottle or two in the house for when you do want one. What a delicious drink! I love the taste of the lemon with just a slight underlying flavor of absinthe, mmmm! I might actually think this drink is a little heavy on the lemon, and I might like it more with a little less, but nonetheless, it’s delicious! 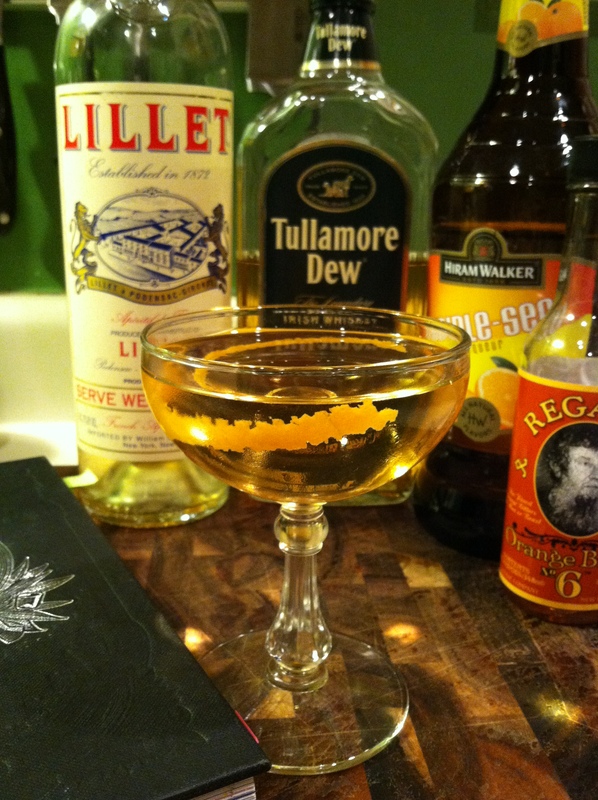 It’s very smooth and easy to drink, but also a bit complex in its flavor mixture, with the Lillet and a little bit of the absinthe (Note: 3 drops means just that, 3 small drops, not 3 dashes). Love it! I’ve been wanting to try this drink for some time, as I love its name too. It’s a pretty good drink. It’s got a unique taste. 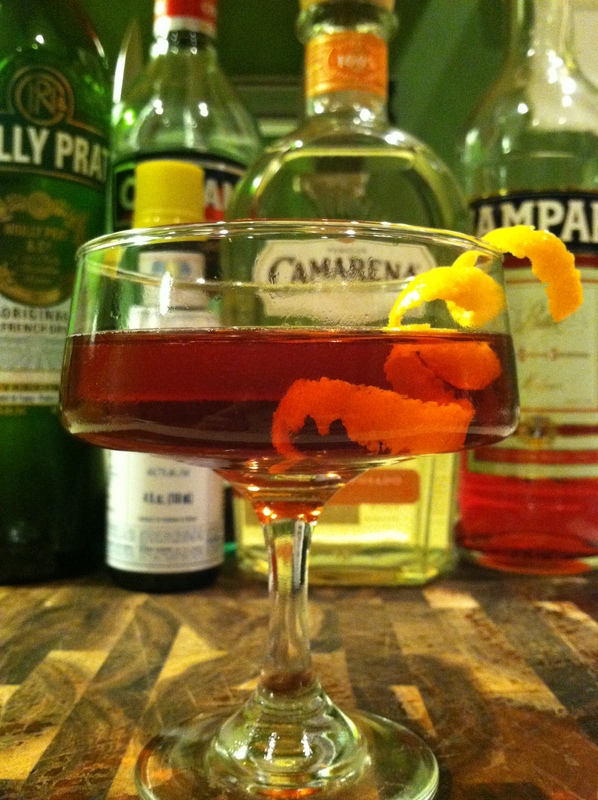 The amaro wrestles with the sweet vermouth, pinning the vermouth’s sweetness and adding a bittnerness, while the orange bitters and bourbon stand on the side lines cheering and encouraging the fight. Good drink indeed. There’s another recipe for “The Liberal” that’s actually more common on the Internet. I, for one, am not a fan of this version. I highly recommend following the recipe above instead. This drink is delicious! It’s dry, citrusy, bitter and smooth, all in one! It’s a really nice cocktail, a perfect blend of tastes and senses. Shake well with ice and then strain into a chilled cocktail glass. This is a good drink, with quite a unique flavor combination with the smokiness of the scotch and the spiciness of the ginger, pulled together by the unifying lime juice. It works very well together though! It’s quite a unique summer-time refresher. Ted Haigh writes in his book that this drink was considered a fancy drink back in its heyday, and I understand why… the scotch soothes the soul while the ginger excites the heart, and the lime keeps it all in perspective. Pour the scotch and lime juice into an ice-filled highball glass, and fill to the top with ginger beer, and then stir gently. This is a pretty good drink. It’s a bit too lemony perhaps, but a nice flavor, all in all. All the different flavors (a little bitter meets a little tart) blend very well in to a good single, unified flavor. Definitely not a bad drink (but nothing that special either). And last but not least… Definitely NOT least! This drink is absolutely AMAZING! This is one of the best drinks around. This drink is so good and delicious! 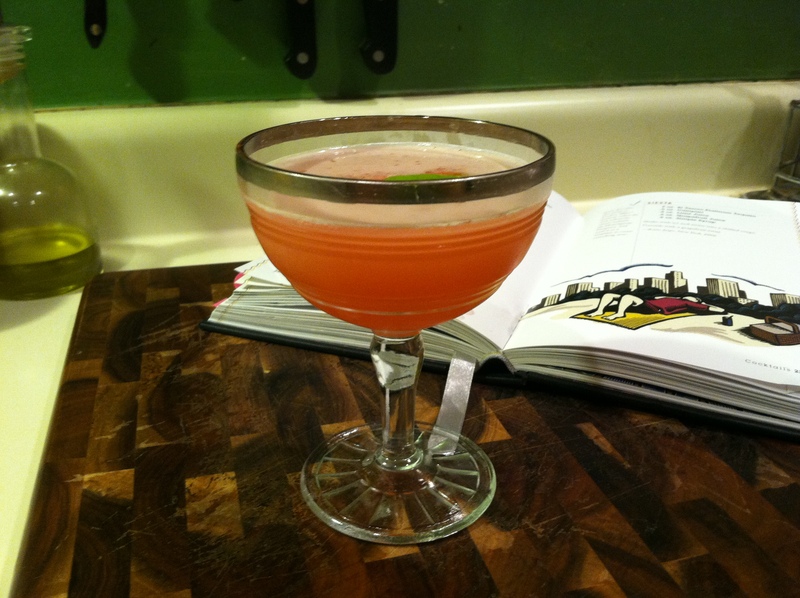 The smooth, sweet tequila, with the tart grapefruit juice and the bitter Campari, smoothed out in relief of the simple syrup… Mmmmmm… a perfect mix of flavors! It’s a complex drink that’s both an “easy goin’ summer-time drink” and a “sophisticated cocktail” at the same time. Write this one down, then drink it down, folks! Well, I hope everyone had a great Memorial Day holiday weekend. I sure did! Today was my first day back to work after a really nice, long 5 day weekend. I really didn’t make many new cocktails over the holiday weekend however, instead focusing more on drinks best suited for brunches and do-nothing relaxation such as the Bloody Mary and Mimosas. Now that I’m no longer just lounging around with nowhere to be at any certain time, and back to keeping a schedule, I need drinks better suited for enjoying after a long day of work, unwinding in the evening time. 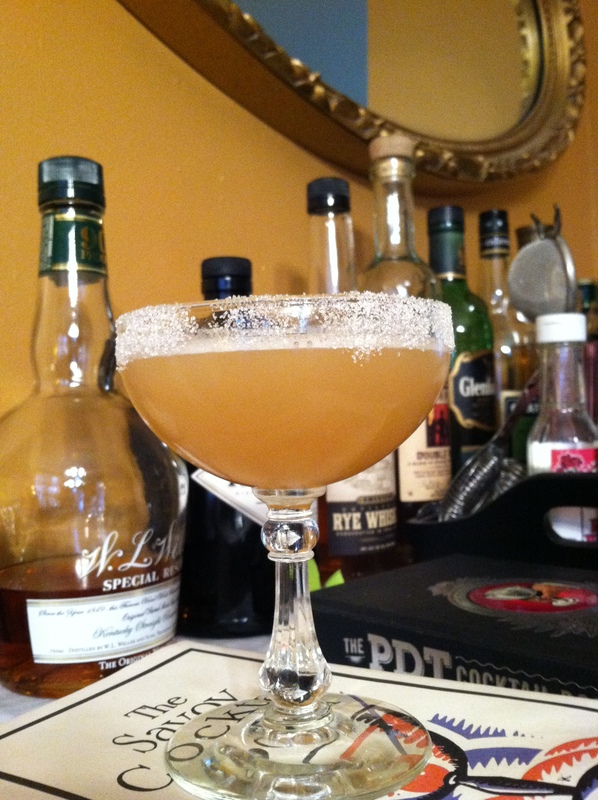 In this post, I have 3 good cocktails to share with you… two of them, the “Blinker” and the “Xanthia Cocktail”, being very old drinks from books of mine and the 3rd being one of my own creation, named 5 minutes ago after my St. Louis neighborhood – the “Clifton Heights Cocktail”. 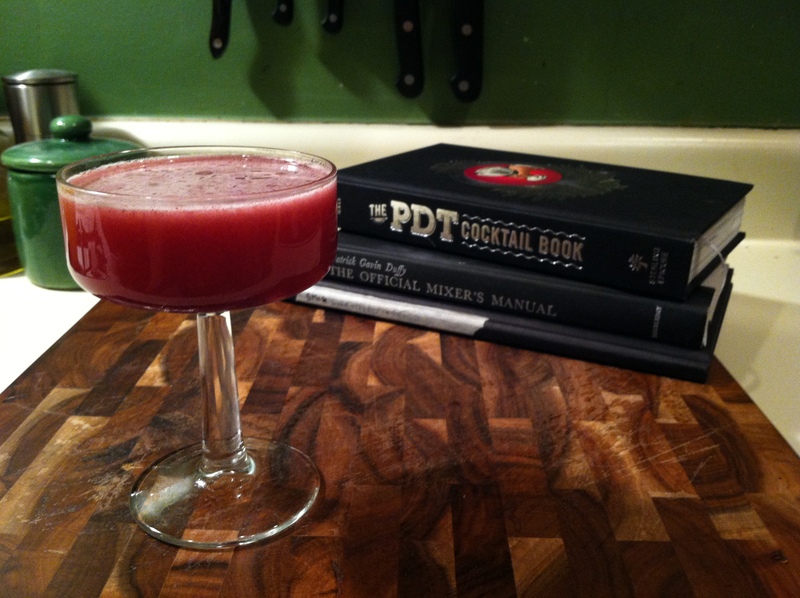 I found the Blinker in my PDT Cocktail Book, which coincidentally comes from a book I just recently picked up at a used book fair, Patrick Gavin Duffy’s “Official Mixer’s Manual”. The Blinker’s a pretty good drink, and a very easy one to drink. 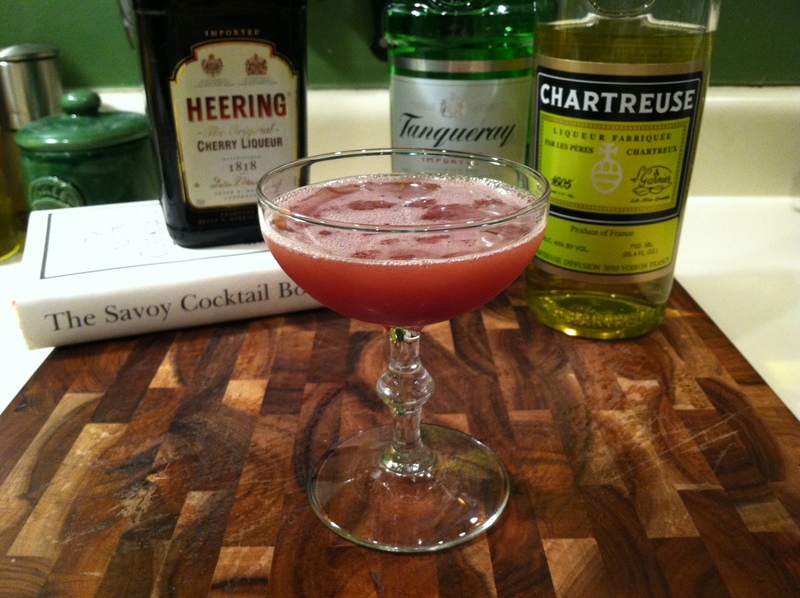 It’s a cocktail that’s heavy on the fruit flavor, but in a very smooth, subdued and subtle way. The raspberry preserves add a real big fruit punch, while the simple syrup tones it down and keeps the fruitiness in check. The grapefruit also keeps the fruitiness in check with its light characteristic mellowing it all out. And as you may or may not have picked up along the way, reading my blog, I love rye whiskey and I also love a drink with grapefruit juice! All-in-all, a pretty darn good drink. Shake well with ice, then strain in to a chilled cocktail glass. The Xanthia Cocktail is not one of my favorite drinks, but it’s a decent one. I picked this one out of “The Savoy Cocktail Book”. 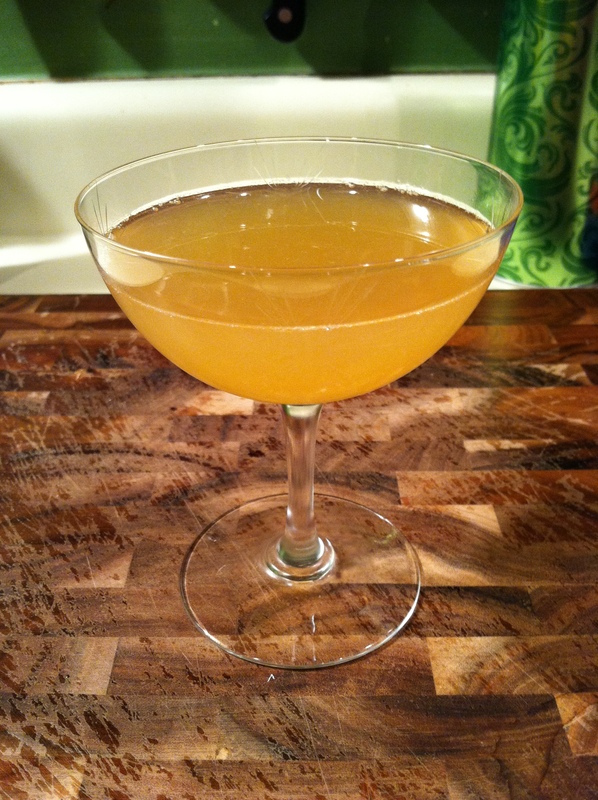 The yellow Chartreuse definitely takes center stage in this aromatic drink with a kick. The cherry brandy and gin hang in the background, blending nicely and both slightly mellowing and propping up the Chartreuse front and center. If you want a Chartreuse drink, this is it for you. If you’re not in the mood for a Chartreuse drink, this is not it for you. Last but not least… actually this one’s my favorite of the three. 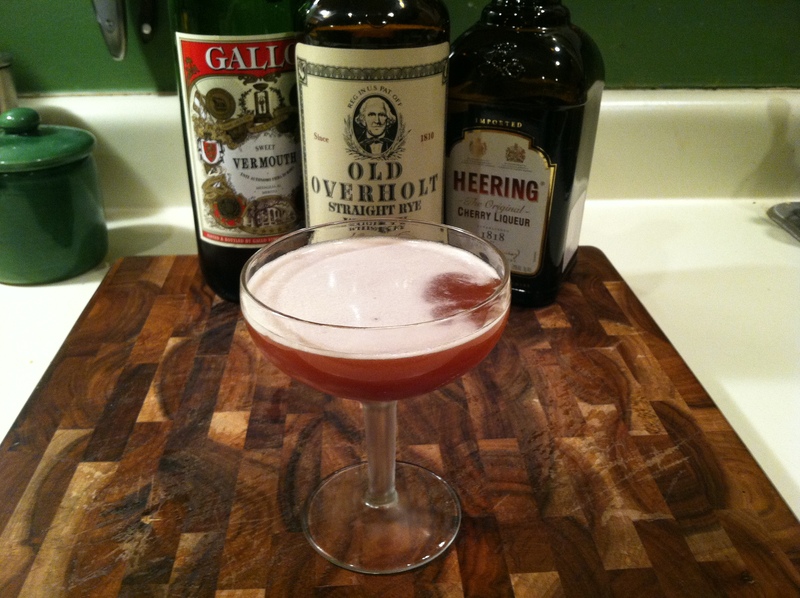 I’ve been experimenting lately with modifying one of my favorite cocktails, the “Blood & Sand”, by tinkering with its 4 ingredients (1:1:1:1) and switching out different ingredients a couple at a time. Rather than starting a completely new drink totally from scratch, this tinkering method is a nice, easy and safe foray in to creating my own cocktails. 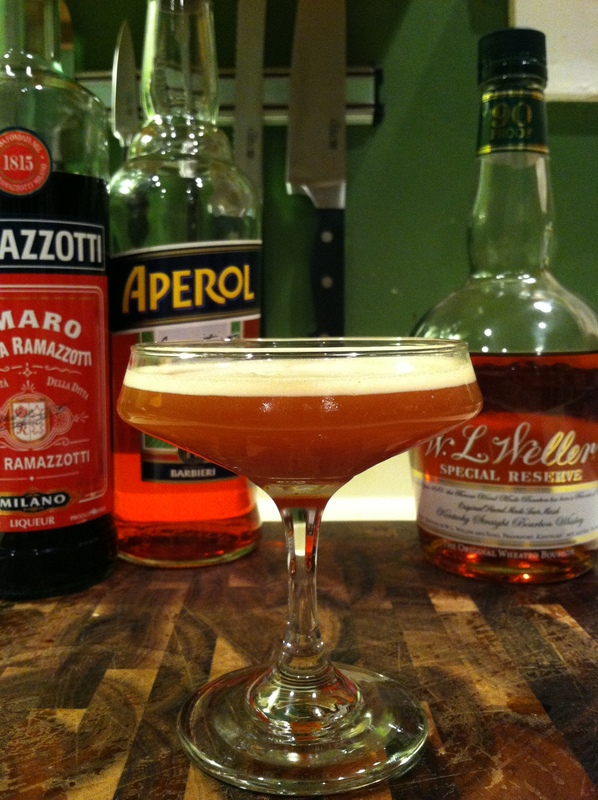 The “Blood & Sand” is made of equal parts scotch, Cherry Heering, orange juice and sweet vermouth. In follow-up to my recent reminder of the fact that I love rye and I love grapefruit, surprise… I worked those two favorite ingredients of mine in to the classic B&S recipe! 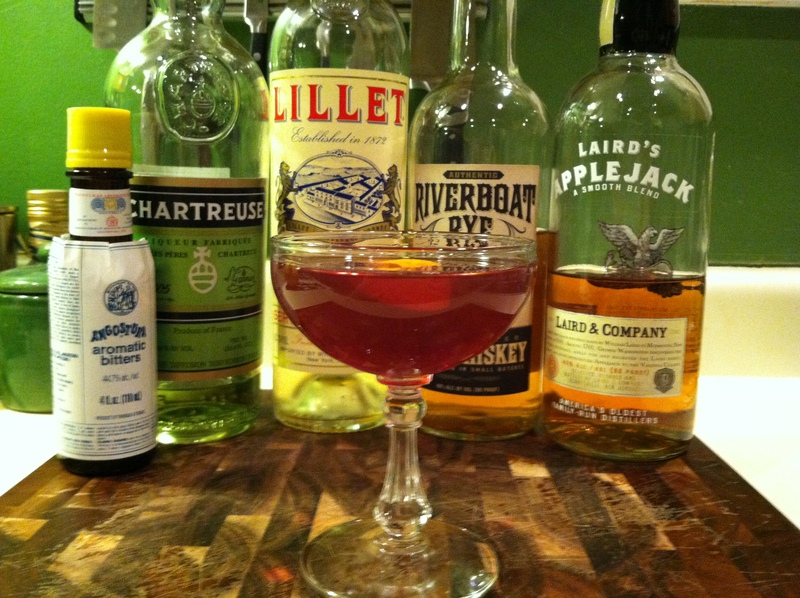 I swapped the scotch with rye whiskey and the orange juice with grapefruit, keeping the Cherry Heering and the sweet vermouth. And it turns out to be a really great drink! It’s still got the rich, dark sweetness of a Blood & Sand because of the Cherry Heering, but because of having grapefruit instead of orange, it’s not quite as sweet. It’s less of an “out there” flavor combination than the Blood & Sand, and more of a familiar, common sense flavor mix. While I love the Blood & Sand because it’s kind of a crazy mixture of unique, vibrant flavors, I like this drink a lot because it’s got some of the same elements while being a really great balance of a smooth, no-nonsense flavor combination. I’m proud to say that I really like this cocktail. And since I couldn’t think of a clever name that’s a fun twist on the Blood & Sand moniker, I stuck with just naming the drink I made up, derived from one of my favorite cocktails, after the St. Louis neighborhood I live in and love, Clifton Heights. In my last post, I declared winter to be officially over and introduced some new ingredients that I splurged on to inspire some new springtime drinks. Well, these ingredients are gleefully being used! I’ve got four new great cocktails for you featuring anejo tequila, Aperol, Rothman & Winter orchard pear liqueur and rhubarb bitters! All four of these cocktails are top notch, and so fortunately, I’m now sitting back, enjoying the beautiful weather and feeling very good about my bulk booze purchase. The first cocktail, and definitely my favorite of the four, is the Eclipse Cocktail. This drink is SOOOO good! It kind of reminds of me of the Blood & Sand cocktail (one of my favorites!) in that the smokiness of the anejo tequila reminds me of the B&S’s scotch with lemon instead of orange, Aperol instead of sweet vermouth, and of course the Cherry Heering as Cherry Heering. This drink is mighty good. It’s got a fresh kick of tequila shrouded in a velvety curtain of citrus and cherry… mmmm. This next drink is an interesting one for me. It’s very heavy on the rhubarb, which at least in my town of St. Louis, is not the most common flavor. Yes, I see a rhubarb pie from time to time, but when I do it’s usually a pleasant surprise and seems like a rare opportunity. In fact, I’d never tried rhubarb until I was an adult. I like rhubarb though. Something… maybe its obscurity, maybe the fact that it’s a vegetable but it tastes like a fruit, I don’t know… but something about it kind of freaks me out in a good way. I like it though, and I like this drink that is definitely heavy on the rhubarb… an entire half-ounce of the rhubarb bitters in fact! 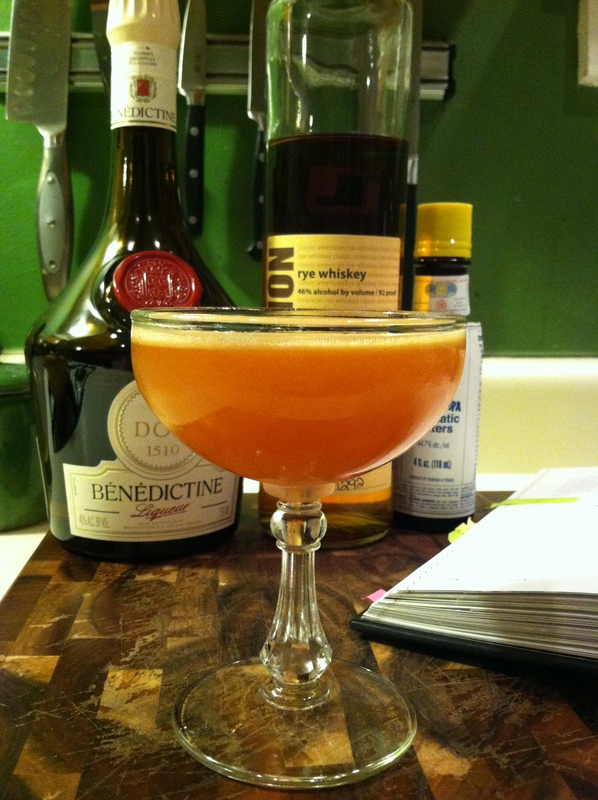 The first time I made this drink, I scaled the use of the bitters back to 5 dashes (which is still typically a liberal amount of bitters). The second time I made it, I went for the entire half-ounce, as the recipe calls for, and it was a good call. The rhubarb definitely takes a front seat, but that’s the point I guess. 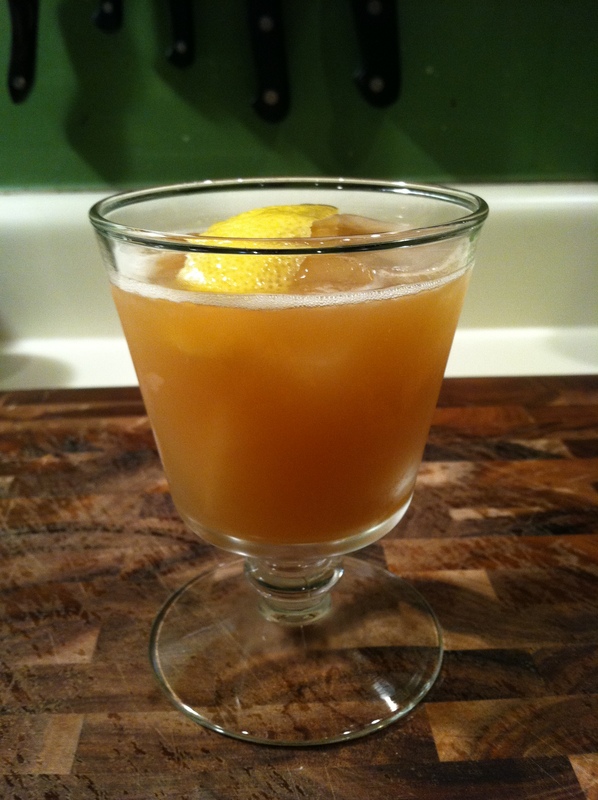 It’s a very refreshing, springtime whiskey drink. 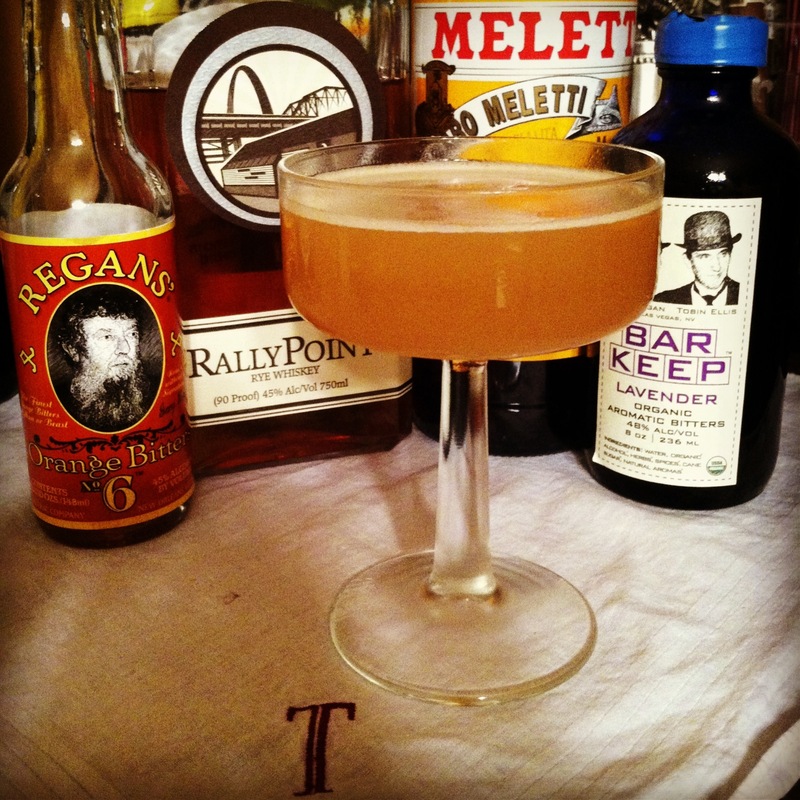 The rye definitely plays in the distant background and the rhubarb, along with its citrus friends of lemon and orange, takes center stage. Very nice! This was an interesting drink too. It reminded me of a Martini. It was good, and had the crisp bite that a Martini delivers. 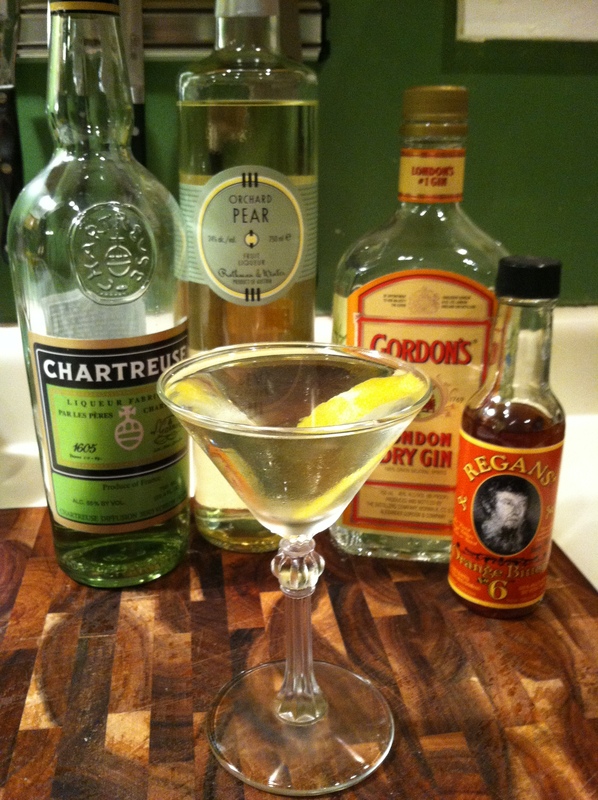 The Chartreuse, oddly enough, takes the place of the Martini’s olive(s), and the pear liqueur smoothly and effortlessly takes the place of the dry vermouth. If you like a Martini, but are open to something new, give this one a try. Stir well with ice and strain in to a chilled cocktail glass. 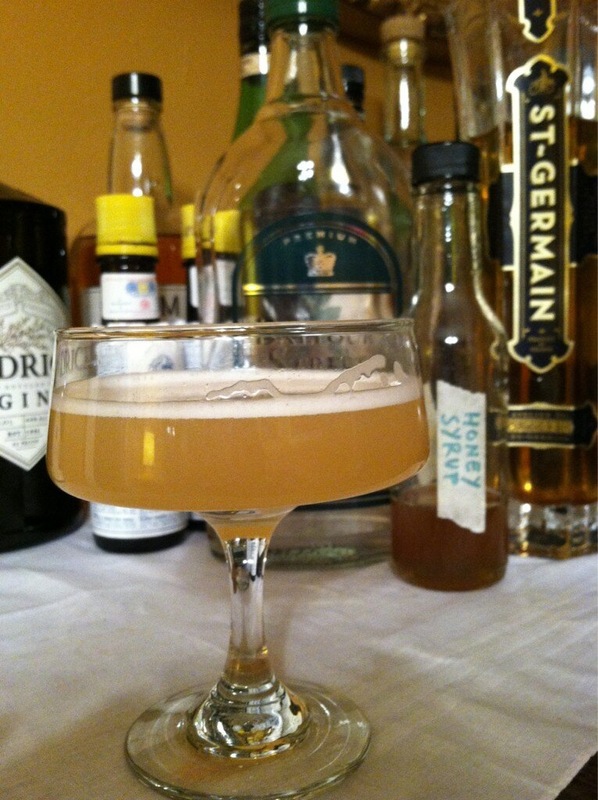 Last, but definitely not least, is the “Improved Whiskey Cocktail”. This is a very good drink! 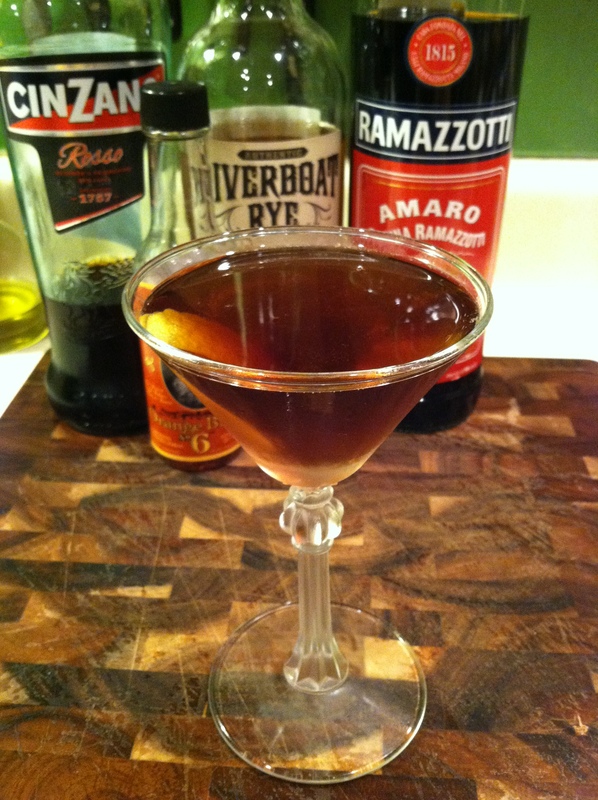 The maraschino and absinthe rinse add a real depth and very subtle complexity to the nice and smooth whiskey base. 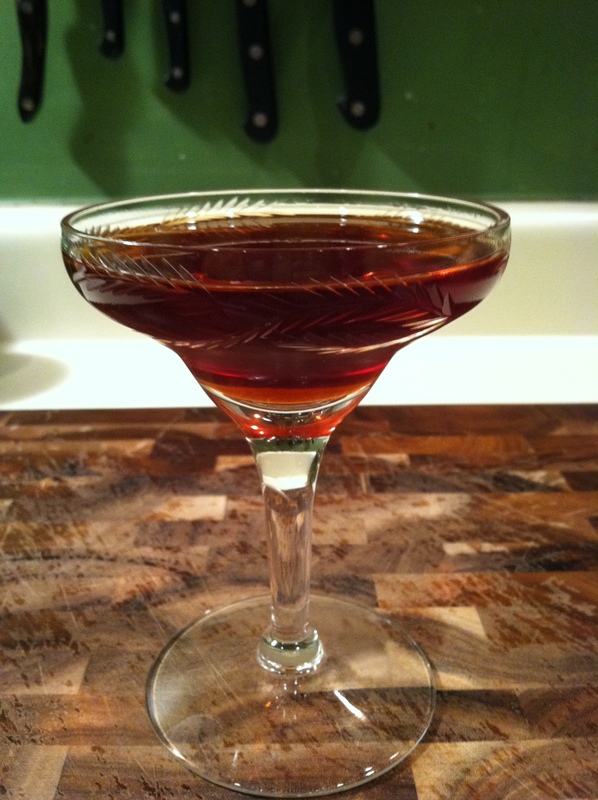 The whiskey’s nice and smooth because of the simple syrup. This is a very good whiskey drink that goes down very nicely. Stir well and strain in to a chilled, absinthe-rinsed rocks glass. Add a few ice cubes and garnish with a lemon peel. Money well spent indeed! Spring is here! Let’s get snooty and drive around town! It’s been nearly 2 months since I last added something to the ole SMcG blog, and it’s because of two reasons… 1- the holidays – I haven’t been experimenting and trying new drinks with all the running around, and I’ve been guzzling the old classic stand-by of brandy and eggnog, along with the classic champagne cocktails for the new year, and 2- bad fortune – The drinks I have tried, I haven’t been too crazy about, except for 2 that wound up being among my list of favorite drinks – “The Vanderbilt” (the “snooty” tongue-in-cheek reference of this post’s title) and “The Sidecar” (the “drive around” part of the title – I love the visual of drinking this cocktail whilst sitting gleefully in a motorcycle side car)! 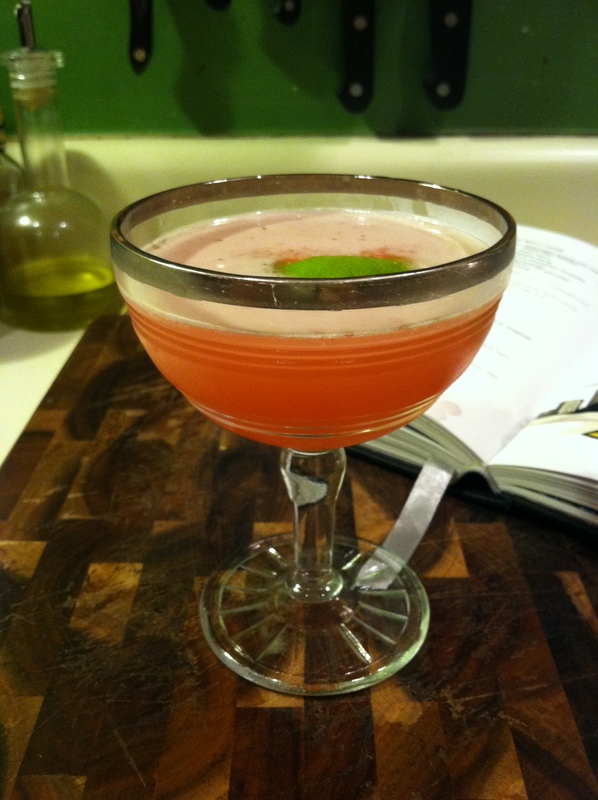 As my readers may have come to know, I love cocktails with just a few ingredients the most. Nothing against drinks with a laundry list of ingredients, they can be great too. But there’s something about enjoying the simple combination of 2 or maybe 3 ingredients, that allows you to really enjoy the taste of each individual ingredient. 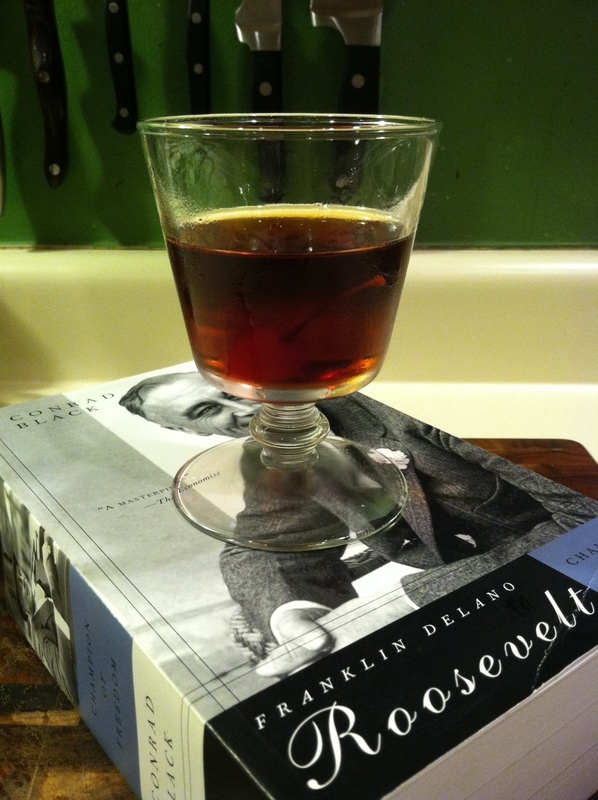 Plus, unlike some “showmen” of the drink slinging business/hobby, I like quick and simple drinks to throw together. I like to have a drink come to mind, and have it in my hand in just about 5 minutes, enjoying instant gratification. Both of these drinks (the Vanderbilt and the Sidecar) fit that description. For these 2 drinks that I love, I also tried 2 drinks that I did not care for much – the “Night Shade” (1.5 oz bourbon, 1/2 oz sweet vermouth, 1/2 oz orange juice and 1/4 oz yellow Chartreuse, served on the rocks with a half slice of orange and a half slice of lemon for garnish) and the “Algonquin” (1.5 oz rye,3/4 oz dry vermouth, 3/4 oz pineapple juice and 2-3 dashes of orange bitters, served up). The Night Shade was OK, but the Algonquin was really terrible. The Sidecar’s another great brandy drink. It’s not as wintery of a drink, but still gives you that nice smooth brandy taste. 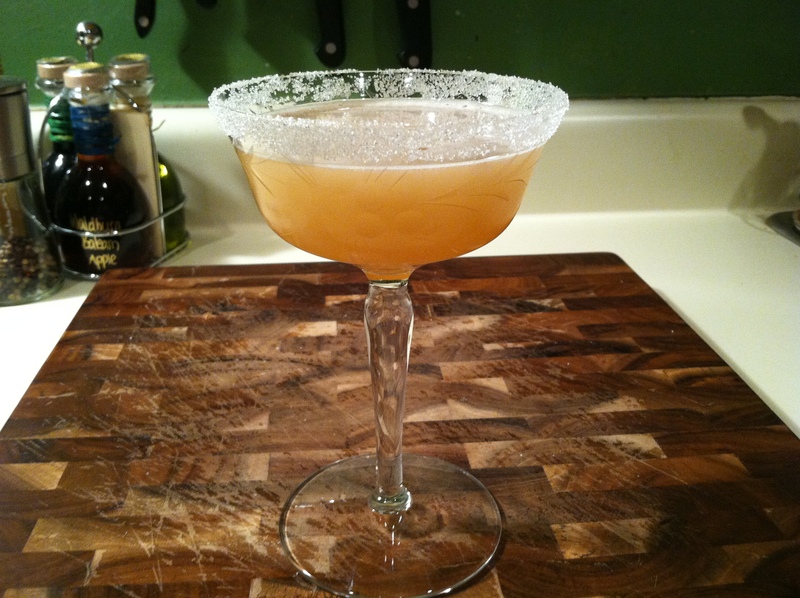 It’s almost a brandy margarita, only with a delicious sweet sugar rim instead of salt. It’s sweet and sour, and super refreshing! Brandy is quickly moving up my list of favorite base spirits in my cocktails! Shake well and strain in to a chilled cocktail glass that’s been rimmed with sugar using a wedge of the lemon.